Although around the globe it is the second most popular sport behind soccer, Biathlon has yet to catch on in the United States. Biathlon is a winter sport that combines cross-country skiing with precision target shooting. 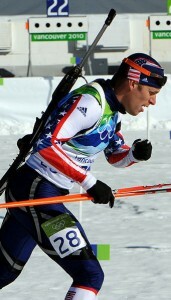 The event requires athletes to go from a broad vision for cross country skiing to a narrow focus for shooting at targets mid-race. The racer incurs time or lap penalties for missing targets. Although these two events may seem like an unlikely combination, when you take a look at the historical significance of the sport, it doesn’t seem like such an improbable pair. 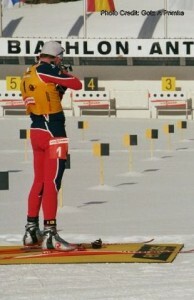 Biathlon is derived from hunting and winter warfare. As early as 3000 BC, there are clues that hunters in the northern hemisphere used skis to hunt down their prey. Rock paintings from this era depict hunters with bows and arrows skiing on wood timbers. Around 400 BC, Roman, Greek and Chinese writings also describe the early markings of this worldwide competition. This winter warfare developed out of necessity in northern countries, where traveling through the snow proved difficult. During the Middle Ages, military patrol operated on skis, and by the 19th century, Germany, Austria and Switzerland all had soldiers on skis. The sport most likely derived from competitions between Norway’s border patrol. 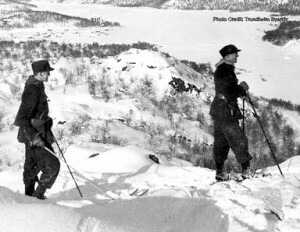 The first official contest commenced at the Swedish-Norwegian border in 1767 and was appropriately named Patrol Race. Biathlon began as a demonstration sport at the Chamonix Winter Olympics in 1924, but it wasn’t until 1960 at the Squaw Valley Winter Olympics where it became a full medaled sport. What makes this sport truly unique is the contrast between the two paired events. Nordic skiers are some of the highest endurance athletes in any sport, and great shooters must excel in hand/eye coordination. The event has changed dramatically, not just from the original competition at the Swedish-Norwegian border, but also from its inaugural Olympic showing of the sport’s present day version. Prior to 1978 competitors were forced to lug around large bore rifles that were later exchanged for the lighter, quieter .22 caliber counterpart. In the early days of the sport, the targets were also made of glass and shattered on contact. Those targets were later exchanged for metal targets, then paper targets, and finally mechanical targets that flip from black to white when the shot finds its mark. Not only has the equipment changed throughout the years, but the philosophy of the competitors as well. Older generations of competitors reflect on a 100-yard transitional phase from skiing to shooting preparation. This time allowed the racer to slow down their breathing in anticipation of the precision necessary in target shooting. Shooters would spend 45 seconds to a full minute focusing on the target. their heart rate down before shooting. These competitors have taught themselves to shoot under distress instead of calming down before shooting. So even though the competition has changed throughout the years, the foundational elements remain the same. Biathletes go from an aerobic animal to a finely tuned shooter with incredible precision. Although Biathlon is somewhat unknown in the United States, it is the most popularly televised winter sport in Europe. But the US is catching on. The Outdoor Life Network has begun televising the event in the United States to the tune of over a million viewers for major international events. 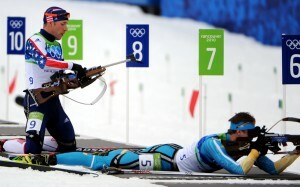 Biathlon will be featured in the 2014 Winter Olympics held in Sochi, Russia.